Join Dr. Karim for a fun & informative night!! The Skinny on Sugars. The good, the bad and the ugly. 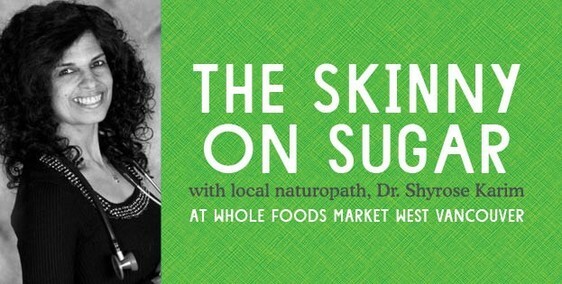 Please RSVP at Whole Foods in West Vancouver. Gluten Free -is it all hype or is there truth to it? GLUTEN FREE LIFESTYLE-Is it hype or is there truth in it? CHOLESTEROL & HEART DISEASE-Is Cholesterol really as bad as we are led to believe? What role does it play in heart disease? Back by popular demand`GLUTEN FREE LIFESTYLE-Is it hype or is there truth in it? Come join Dr. Karim in these round table discussions. Please RSVP at Whole Foods in West Vancouver Park Royal Village or drop in on the day of the round table discussion. If you are in menopause or peri-menopause and experiencing fatigue, increase in hot flashes, and your memory is not as good as it used to be, this is the course for you. Attend and see how these three are connected in producing the symptoms that crept up on you as you entered a life free of your menses. Is there truth to it or is it hype? Join Dr. Karim in a round table discussion to get to the heart of the Gluten Free Lifestyle. Be informed to help you decide if gluten free is for you.